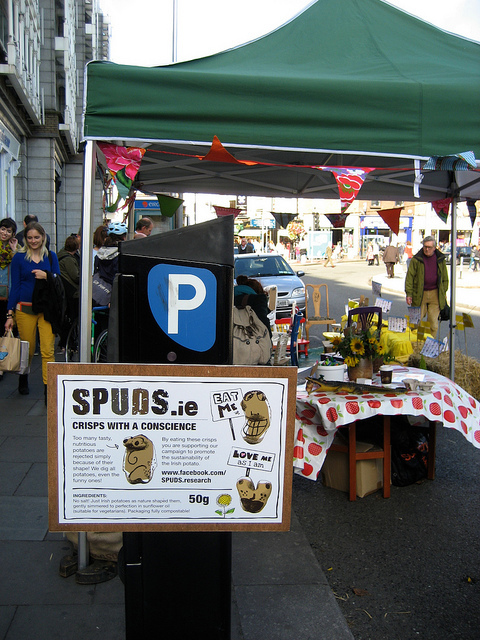 In August of 2012 we commissioned our first run of SPUDS.ie ‘crisps with a conscience’ to explore the use of crisps as a communication vehicle for our SPUDS research, raise awareness around the issues that emerge from this process and to generate funds for the project . 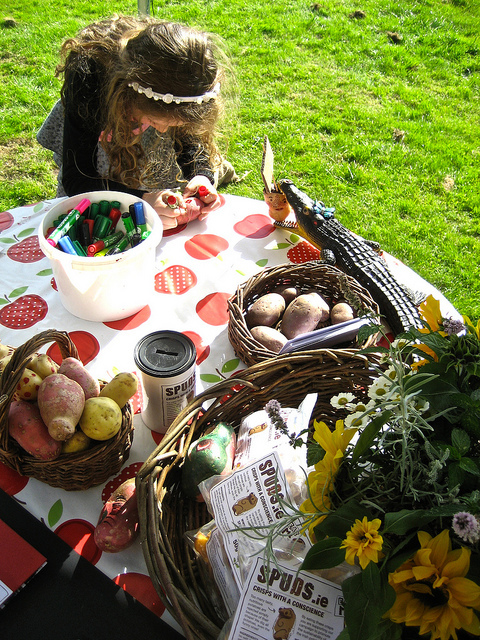 We decided to use our first ‘limited edition’ of crisps to highlight the fact that far too many viable nutritious potatoes (and vegetables in general) are rejected by the marketplace simply because of their shape. One aspect of crisp production we immediately found challenging was packaging. The composite material conventionally used to keep crisps fresh is not biodegradable and cannot be recycled. Our search for an environmentally friendly alternative lead us to packaging manufacturers Innovia who generously donated a roll of Natureflex, a compostable packaging material made from wood pulp, for us to trial. We commissioned Keogh’s of Oldtown, Co Dublin to manufacture the crisps and asked them to use the ‘wonky’ shaped Roosters that hadn’t met the supermarket standards for size and shape. Keogh’s were initially concerned that Naturflex may not hold the seal required to keep the crisps in tip top condition. On the contrary, the packets almost impossible to open, happily proved them wrong and the crisps remained deliciously crunchy until long past their sell by date. 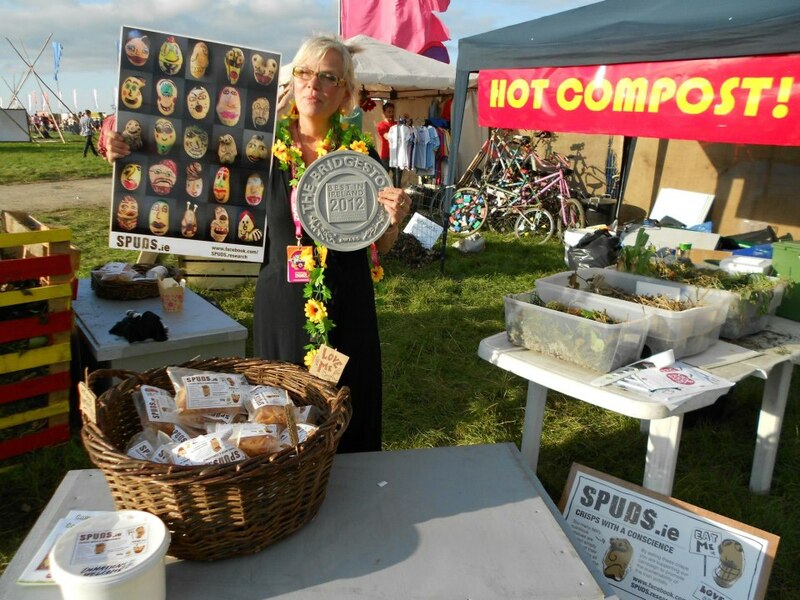 SPUDS.ie ‘Crisps with a Conscience’ made their first appearance at the Electric Picnic on the ‘Stop Food Waste’ Stand in the Global Green. 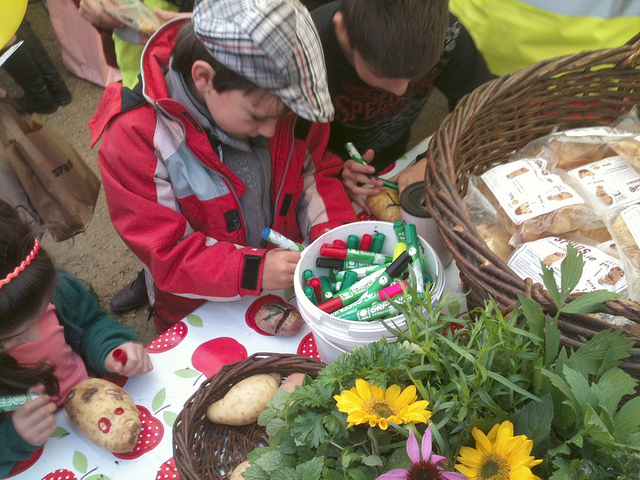 Our ‘naked’ crisps contained only two ingredients, potatoes and high quality sunflower oil. We were curious and a bit apprehensive, wondering if they would catch on with the beer swigging, salt craving, festival crowd. To our delight, they were extremely well received. Customers enthused about the fact that they were not overly flavored and tasted “like…POTATOES!” We were even more astonished when John McKenna and his team presented us with a special Electric Picnic Bridgestone Food Award for improving the taste of a traditional food product and giving it an ethical agenda, a category they invented especially for us! See coverage of the awards on the Daily Spud Blog. 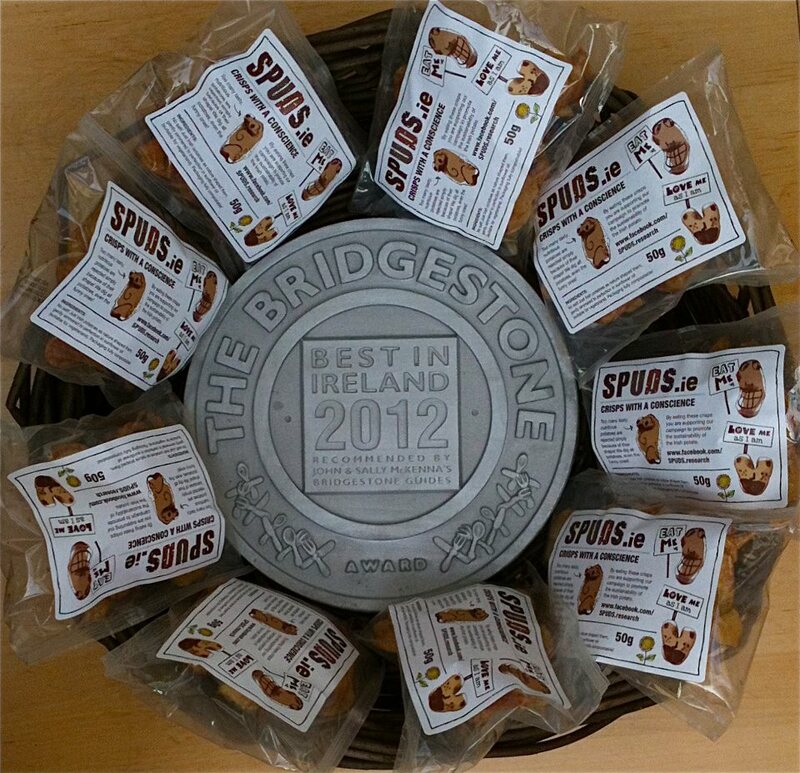 During the month of September our crisp sales paid our expenses as we traveled to six festivals promoting SPUDS research and continued to make a big impression. 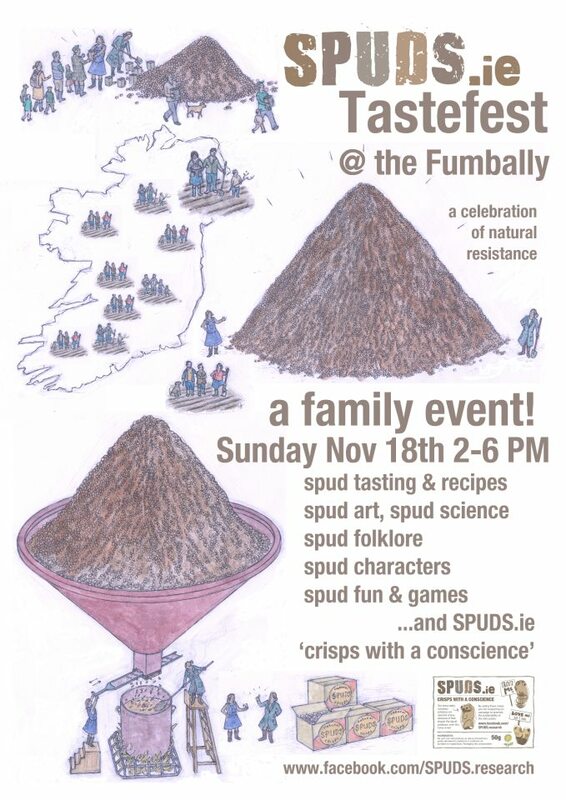 Sales generated by Ballymaloe Cookery School Shop in Cork and the Fumbally Cafe in Dublin helped fund our first ‘SPUDS Tastefest” in Dublin last November where we celebrated spud art, spud science, spud culture, spud biodiversity and gave the public an opportunity to taste and vote on their favorite natural blight resistant variety. 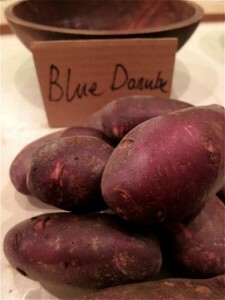 The winner: The naturally blight resistant Sarpo Blue Danube. Subsequently SPUDS.ie ‘Crisps with a Conscience’ revelled in some international travel and received enthusiastic feed back everywhere they went. The image at the top of the page is a packet basking in a trendy San Francisco pad with a cool ‘jar’ of artisan beer. 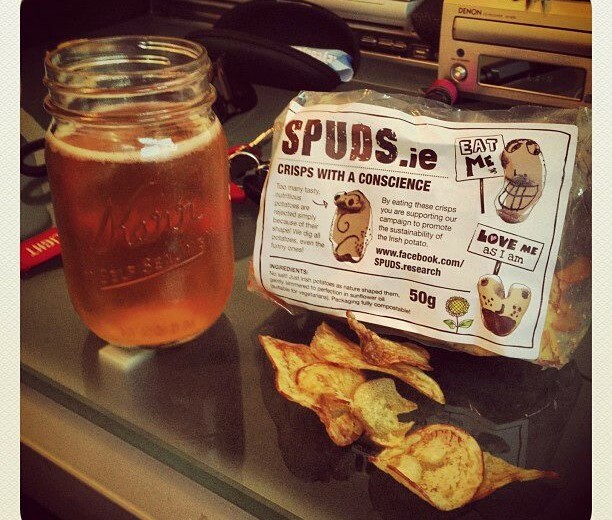 We have big plans for our crisps in 2013. A generous donation to the project has made it possible to buy a 3/4 ton of Sarpo Axona blight resistant potato seed and commission county Wicklow farmer, John Swaby-Miller to cultivate them in a rich field that has laid fallow for the last 60 years. Depending on this year’s growing season we hope to have a healthy yield of spuds for our next limited edition of crisps which will feature the advantages of the natural blight resistant spud. 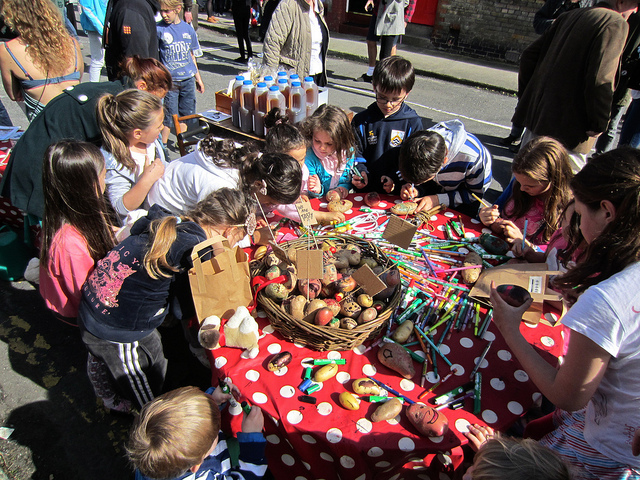 We are dreaming up a scheme to collaborate with the public (YOU!) 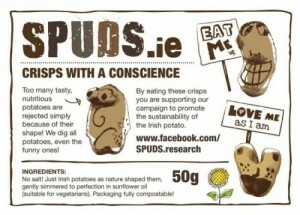 to co-create the content for a SPUDS.ie ‘exploding project pack.’ No ordinary packet of crisps, we see our next limited edition as an interactive bag of fun, stuffed to the gills with crisps, spud-art, spud-games, spud-science experiments, along with the chance to win a ‘golden ticket,’ reminiscent of Willy Wonka! Keep your ears to the GROUND (hear those spuds growing? ), pray for RAIN (yes!) and give us a shout if you would like to help us make the SPUDS.ie ‘exploding crisp project pack’ a reality!